Get the lowdown on applications, plus a handy list of resources and organisations that offer students financial support. Whether you're calculating the costs of going to uni or figuring out just how you're going to make it through the next year, there's millions of pounds in free funding that you may be entitled to (although unfortunately, it's not all for you). Sound too good to be true? Kind of. For one thing, bursary and scholarship cash comes with eligibility criteria. And secondly, finding out what's available, what you're entitled to and getting your hands on the cash will take time, legwork and perseverance. That's why we've put this guide to funding sources together to get you on the right track. Let's go! What are bursaries and scholarships? What extra funding is on offer for students? Our guide to bursaries, scholarships and grants has a list of the major funds – it's worth checking if you're eligible for one of them before spending your time finding others. Bursaries, scholarships and grants all help students who need financial support get through university. Unlike your loan, none of these need to be repaid. They're all basically the same thing (i.e. a pot of money that isn't repayable), but there are some distinctions between them. Grants (covered here) typically come from government money, while bursaries and scholarships may also be funded by private companies, individuals, or anyone else who feels especially generous. Grants and bursaries also tend to be income-dependent, while scholarships are typically based on merit (like academic or sporting achievement). Who gets what can be harder to figure out than the ending to Inception. There are schemes for school students, mature students, postgrads, students with disabilities or dependants, and funding for full-time, part-time, higher and further education courses – and they all vary across the UK. Sadly, there’s no unified system that helps students see what’s available from one place. But to help get you started, we’ve got you covered with the basic facts and funders. Which bursaries and scholarships are you eligible for? All universities and colleges offer bursaries for students from low-income families. Some will even calculate your eligibility for you when you apply for your course (if you share your income details from your student finance application) and will automatically make an award of cash, fee discounts or equipment. Lots of bursaries/scholarships are dependent on household income, but not all of them. You can also get funding for academic success (whether it's success in your A Levels/Highers or the uni entrance exams), subject choice or sports. Some charities offer funds for a whole range of circumstances, although again you may find you're not eligible for most funds (they're often based on factors like location, religion and race). There are also bursaries set aside for international students and even career choices (including NHS and teaching and social work). Even if you don't think you'll qualify for anything, it's worth looking – there are some seriously unusual bursaries, grants and scholarships out there, and you could easily be eligible! Bottom line? If you want to find a bursary, search creatively. Where can you find a bursary or scholarship? We've outlined some of the main sources below, but before you start hammering Google for scholarships info, it’s best to start close to home. If you're at school, talk to your careers department – they may know about any community funds you can get your hands on. 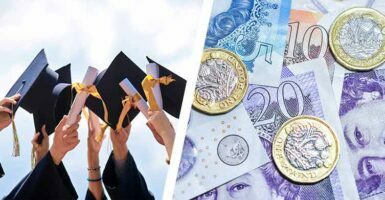 Next, hit up your local authority (council) – some will have pots of money set aside to help students from the area go to uni. If you already receive funding (for a disability, for instance), chat to your funding officer about what else is going. Now's also the time to search for 'bursary' on your regional government direct or student finance portal (be warned: some sites are better indexed than others). Spend some time perusing your university's website (they'll list what's on offer, along with eligibility and deadline info), or get in touch with the student union's welfare office. If you're applying to a collegiate university (one made up of several colleges), ask about college cash as well as uni-wide funds. Finally, if you’re returning to study, don’t dismiss the idea of asking your employer or job centre about back-to-school incentives. But when possible, apply early – Scholarships attract fierce competition and don’t do deadline extensions. Start applying in the autumn of the year before your course starts, if you can. Once you've found potential funds, make sure you check all the deets. There's no point in applying for the John Smith Fund if the requirements state you must be either Catholic, dyslexic or a single parent, and none of those things apply to you! Find out when you'll get the money, and plan out how you'll spend or save it. You should also check what happens to the cash if you drop out of uni, if your household income changes, or if taking the money means you're tied to working for a specific organisation when you graduate. Some external funders (e.g. charities and corporations) may want you to write a personal statement or budget plan. If it’s a scholarship, you may need to attend an interview or make a presentation. The most comprehensive list of scholarships for UK students available all in one place. Includes those offered by universities themselves, companies, charities, trusts and other organisations as well as information on sponsored degrees and degree apprenticeships. A good place to start if you're interested in the charity route – though be aware that not all the charities listed will offer money for education (it may be for carers, those with a disability or people experiencing financial hardship). Geared towards international students looking to study in the UK, this site links to lots of relevant sites worth checking out, and has a pretty decent subject search, too. This is a top-up fund to the Disabled Student Allowance (which you'll need to have applied for first). You must be in full-time education to be eligible and could get up to £500. If you're taking a hospitality or catering related degree then this could be of use to you – up to £500 to help pay towards fees or equipment, such as your uniform and tools. Are you talented? Are you an athlete? Boom. This one's for you. If you're a pro athlete you could receive support and services from the TASS. Crowd Scholar award scholarships to students from disadvantaged backgrounds to help them attend university. There aren't too many awards on offer (as Crowd Scholar themselves say, "£10,000 towards one student’s education makes a bigger difference than £100 to one hundred students’ educations"), but if you meet the criteria, it's well worth applying. Check out our guide on everything you need to know about Student Finance – you may find you're eligible for extra funding there that you weren't aware of! Once you've got your extra money, don't blow it all on a trip to Vegas. And, if there's money available over more than one year, don't forget to re-apply if that’s part of the deal. If you're struggling to find funding, or still can't balance your books, don't give up. Talk to your university or its welfare officers – they've got things in place to try and make sure nobody's unfairly priced out of getting an education. Now you know what we know: go forth and prosper. Good luck! Check out our bumper guide to student grants, scholarships, bursaries and sponsorships. Hi All, We moved to the UK two years . Next year when my son will be attending university, we have not finished 3 years working in the UK to be considered as a home student for loan. He is and outstanding student almost. He has achieved two "Top in the world" awards in biology and physics in IGCSE from University of Cambridge with 6 A* ( 95+) (number of subjects are is not as many as you have in GCSE). He has achieved many gold awards in maths, physics, chemistry and bio in A-level so far. He is an active researcher as well, and have published some journal and conference papers internationally. He will be attending to university next year and now we are looking for a way to get loan or scholarship as I cannot afford his tuition fee. Any help will be highly appreciated. Hi, all please help me find a charity to help me. I did two years of study previously, however, student finance said they will only pay for my last two years of the degree I'm starting this September. That means I will have to pay 9250 course fees this year. I lost my job when the council moved me out of London escaping domestic violence and pretty much lost my confidence my job family and all support network. I didn't complete my two years HnD because of domestic violence and I don't know where to turn to for help. HI im a mature student just finishing my 2nd year, moving onto my 3rd, although i get i think near the maximum amount of grants etc, i am still struggling financially, as i travel back and forth most weekends due to family commitments. Although i have no mortgage to pay, i still have to pay money for "rent" at my parents house with me being 30+ i can't expect to stay there for free, otherwise i would technically be homeless. i now have a maxed out overdraft which i can not extend anymore, and a maxed out credit card because i couldn't extend my overdraft, so I'm in a bit of a precarious position now. Any advice would be greatly received! Hey, try the Princes trust. Hi, unfortunately it seems as if you've managed to hunt down all the funding available. You could try looking at sponsorship from a charity or even private donor. Aside from that your son will need to look elsewhere for income to help fund the degree. The best shout is a part-time job. Where's the best places to apply for funding for my daughter to study at a private institute in America. I'm a single parent and on low income. Hello my name is Becky an undergraduate university student in my first year at university am requesting to find out how i can be helped funding my tuition. Thank you. Hi Claire, thanks for getting in touch. I think the best option would be to gain some sort of official diagnosis. Once you have that you can contact the university to ask what kind of support is available. I'm in a bit of an odd situation here, so any advice would be greatly appreciated. I'm coming to the end of my first year as an undergraduate. I'm a mature student (in my forties) with a learning difficulty that has impacted my financial well-being over the years. I'm on full maintenance grant. My problem is that I have to go into hospital for a major op straight after my exams in June and I won't be able to work at all over the Summer break. It would seem the only benefits I'm entitled to are contributory-based and I know I haven't paid enough stamp over the years to be eligible. So basically, I have no income over Summer. What can I do? The idea of being homeless whist recovering fills me with dread, let alone the need to meet day-to-day costs and I've already got creditors snapping at my heels. Hi Tim, I'm very sorry to hear about your situation. My best advice would be to contact your university support centre to see what they would advise in this situation. Hi, I'm a second-year university student and in September I'll be starting my third year. I am looking for grants ar any financial help but it looks like I'm not eligible for anything! I'm Italian but it's been only a year since I'm leaving in Europe. My family's income is not that low, but I have two younger sisters (one of them also at uni and the other in a private international school 'cause her English is still not good) and my parents have to pay for their studies too. Last year my grandparents and uncle helped with the costs but I am afraid they can't also give us support for next year. If this happens my parents will probably struggle a bit but for sure we won't lose the opportunity to study. Though I am concerned that this would mean spending their money on our studies instead of promoting their recently-opened business. And I don't want this to happen. Would u be able to give me any advice? Thank you. Hi Rosita, sorry to hear that you're in a tricky situation. Unfortunately it sounds like your parents earn above the threshold and therefore the government "suggest" that they should be supporting you and topping up your loan. For this reason you most likely won't be eligible for any extra funding. I'm in the running for a place on the Three Year BA in Professional Acting at Bristol Old Vic Theatre School. I'll be moving away from home, the family's hit some rather dire straights so I can't get any financial support from them and the high contact hours for the course stop me from getting a part time job whilst studying. Is there any help available for me? Hi, do most bursaries apply to second and third year as well as first? for example if circumstances change. If your circumstances change then you may no longer be eligible for the bursary. However, it depends on which one you have received and the terms involved. Hi sorry, i mean if circumstances change from not being eligible to being eligible. So if cirumstances changed to make me more eligible, then do the bursaries/ funds still apply in second and third year? I believe you can still apply although it's worth checking with student finance. Hi, my son was offered a double scholarship at a really good provate school we didn't have all details to go onto make a decision and decided to apply for a bursary, we then decided to decline the offer as we werbt accepted for the bursary so we decided to accept a offer from a really good local academy. I really regret making the decision of not accoeting the offer but they really didnt give us much infornation about the scholarship as we didn't have much clarification on what the scholarship covered and panicked into declining the offer. After searching and looking for good private schools I feel like I have let my son down as we didn't even have the money for the acceptance fee which was £2,000 pounds, I have asked them to put him on the waiting list but still they haven't sent any information of how much the scholarship would cover and we probably would apply for a bursary again do you think we should ? Do you know much about double scholarships? My friends keep saying many charities organisations may help us but I don't know where to start . My son is so gifted he passed everything with flying colours I feel I have let my son down its caused me sleepless nights because he has so much potential it's caused ne sleepless nights . I know he will do well wherever he will get his education but it's such a great opportunity to pass him by what do you think ? Hi, is this for a university course? I'm a little confused. Hi Nicky, most of my knowledge is for university degree funding. I was not actually aware you could get funding for year 7 study, especially if it's for a private school. I would suggest talking to them about this. Hi Kasey, aside from the maintenance loan and any other student loans the funding that might possibly be available to you could be quite unique. With that in mind I would contact the college to see if they can advise you on anywhere to look. I am a high school student, doing her A levels and would like to get a scholarship to study journalism abroad. I am a talented author not by profession and I wrote my first book at the age of 14 but my parents do not have enough money to help me further this. I'm self employed taxi driver and decided to better my life. I have just enrolled for a electrician course so iam a mature student. I have funding from college but was wondering if I qualify for any bursaries. Hi David, is it a UK university undergraduate degree? If not I can't be sure on the funding available. How do I subscribe for this funding information to be emailed to me. I'm preparing for my A level courses aiming to study medicine in Cambridge. My parents can't afford to pay for the course as such I need every financial help that's available. Completely agree re benefits/single parents. I was widowed, my daughter wants to go to uni but because I remarried my husbands salary is included in income even though he pays mortgage where his ex and child live and csa. She won't/can't get a boyfriend so she gets every benefit going and her child can get free uni fees as his fathers salary doesn't count for him. My daughter isn't supported emotionally or financially by my husband yet she can't get any help! Do I gave to divorce so she can get equal help? Country is so wrong.